This is an performance art piece by Gabriele Kaiser-Schanz. There will be more to follow in other cities. The first performance is taking place at the Atrium Mathildenhof in Essen on 01.12.16. The performance features a 20 min. soundinstallation that I created based on the ideas of the artist. 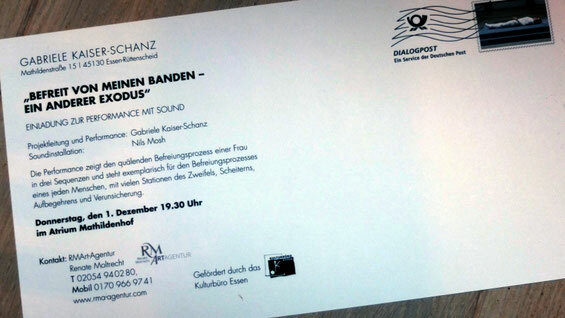 It features sounds I created artifically as well as some field recordings that I captured in and around Essen. You're so interesting! I don't think I've truly read through a single thing like that before. So great to find another person with unique thoughts on this subject matter. Really.. thanks for starting this up. This website is one thing that is required on the internet, someone with a bit of originality! We're a group of volunteers and starting a new scheme in our community. Your site offered us with valuable information to work on. You've done a formidable job and our entire community will be thankful to you.